Australia have booked their place at the 2019 Basketball World Cup in China after defeating Iran 76-47 in Melbourne. In a rematch of the 2017 Asia Cup final, the Boomers again came out on top with a dominant performance at Margaret Court Arena on Friday night. The win gives Australia eight wins from nine Asian zone qualifying matches and guarantees a top-three finish in Group F that sees them advance to next year's finals. South Sudanese Australians and Andrew Gaze condemn 'prejudicial' axing of basketball event 'It's an awesome achievement,' said guard Nathan Sobey (190-G-90, college: Wyoming). 'We are really glad that we can finally take that off our shoulders but we've still got to continue to come out and play the games like we've still got to qualify and play some good basketball.' 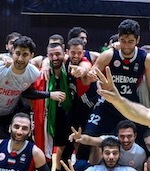 With Iran missing a number of experienced players, including former NBA centre Hamed Haddadi, the Boomers used a balanced scoring attack and stifling defence to overwhelm the visitors. Eleven players scored for the Boomers with Daniel Johnson (212-C/F-88, college: Pepperdine) (12) and Mitchell McCarron (191-G-92, college: Metro St.) (11) leading the way, while the hosts also restricted Iran to a lowly 20% shooting percentage in the first half as they built a 19-point advantage. That lead extended to 30 following a 21-10 third quarter from the home side and while Iran showed some fight in the final term, it was not enough as the Boomers locked in a World Cup berth with three qualifying matches to play. Iran kept pace in the opening stages until Johnson and Adelaide 36ers teammate Sobey sparked the attack as the Boomers reeled off 14 consecutive points. It took a long three-pointer from Mohammad Jamshidi (199-SF-91) to end the Boomers' run with Iran reducing the margin to 24-16 after one quarter. Making his first appearance for the national team since the 2014 World Cup, Nathan Jawai added five points in the second quarter while Iran centre Meisam Mirzaei (210-C-92) kept the visitors within striking distance. But Australia ended the first half in style with David Barlow (205-F-83, college: Metro St.) capping his Boomers recall with a triple while Mitchell McCarron also connecting from outside to put them ahead 43-24 at halftime. Iran pressed early in the third but Nick Kay (206-C/F-92, college: Metro St.) and Cam Gliddon helped the home side regain control, Todd Blanchfield's late dunk handing the Boomers a 30-point lead at the final change. Former AFL player Craig Moller made his Boomers debut in the fourth quarter, adding five points and five rebounds in eight minutes.